Before the Meiji era, at which time Japan adopted the Western calendar, the old calendar was based on the phases of the moon. The full moon always fell on the 15th day of the lunar month, and the full moon of the first month of the year was celebrated as Koshogatsu 小正月. Today in Japan, this festival is often celebrated on the 15th day of the 1st month, i.e. January 15th, although this now has no connection to the full moon (what a pity!). 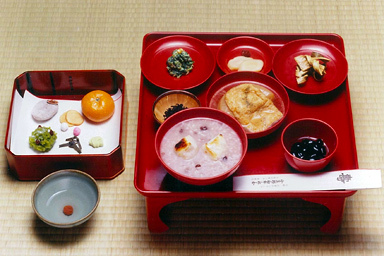 Since the Heian era, on the morning of Koshogatsu, a special rice porridge made with red azuki beans and mochi is eaten: In Japanese, this special dish is called azuki-kayu 小豆粥, but in Kyoto it is called azuki-no-okaisan. At Torin-in there is a special Buddhist ritual performed on the morning of January 15th, which the public are welcome to join, where a little bit of the azuki-kayu is offered to all the trees in the garden of Torin-in, while sutras are being chanted. 1. Soak the azuki beans overnight and then rinse. 4. Make okayu with the rice. 5. 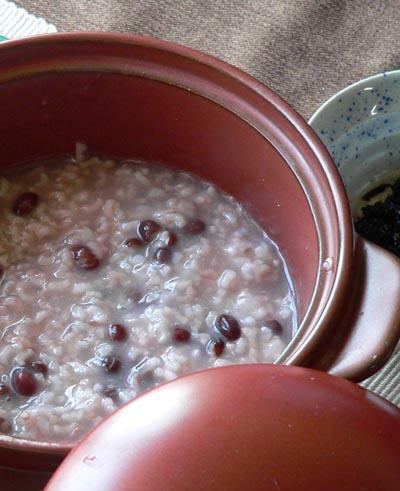 Add boiled mochi to the okayu, then add a suitable quantity of the now-softened azuki beans from the thermos.